A People’s Cabaret is a Trad Arts Team crossover event with more contemporary music, song and politics. The Team has not run the Cabaret for a while but when they knew David Rovics was available they couldn’t resist. David will be on at A People’s Cabaret on Monday 12 September at 8pm. Get your tickets now because we will be sold out. 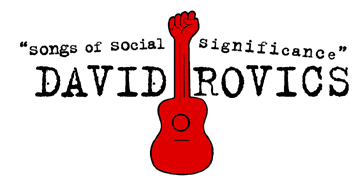 In the mid 90’s David was a full-time busker in the Boston subways and by the mid-90's he was travelling the world as a professional flat-picking rabble-rouser. He now tours regularly on four continents, playing for audiences large and small at cafés, pubs, universities, churches, union halls and protest rallies. The 200+ songs he makes available for free on his website Songs of Social Significance have been downloaded more than a million times. Most importantly, he's really good. He will make you laugh, he will make you cry, he will make the revolution irresistible.